Thirsty Pilgrim: Beer and Breakfast in Plain English. Up at 4 a.m. Which is no big deal these days, thanks to Junior. Aiming to get to the station early. Train leaves at 6:59 a.m., arrives around 8 a.m. London time. A two-hour trip, but it's as if England has awarded me with an extra hour of life. So I spend it on breakfast. My old friend the Betjeman Arms at St. Pancras, sadly, is no longer open that early. Not until 10 a.m. Fine. 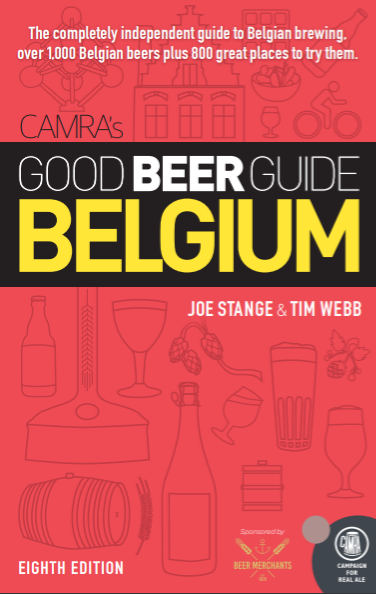 I consult Podge's guide... not too many (pub) options this early... and I'm off to the Fox & Anchor. This is a classy Victorian gastro-pub near the Smithfield Meat Market. (I thought I'd seen London meat markets before, having been out to the late night clubs. But no, I'm told this is an actual working market where foodstuffs are bought and sold. Interesting.) 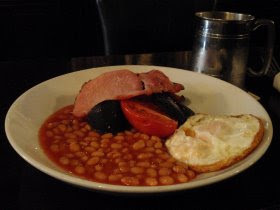 There are several pubs in London as nice as the Fox & Anchor, but one way it distinguishes itself is the morning hours for market traders and serious breakfasting. By the way, it also has six rooms and they look pretty damned nice. Food. I could have gone with Eggs Benedict, but if I'm priming for a Great British Beer Festival, I've got to go with the proper English breakfast, don't I? Fried eggs, thick bacon, two sausages, blood pudding, beans, juicy tomatoes, grilled mushrooms, toast. I'm forgetting something. Oh yeah, a pint. In this case, a pewter tankard of Nethergate's soft, nutty and fruity Dr. John's Panacea. It was decent. 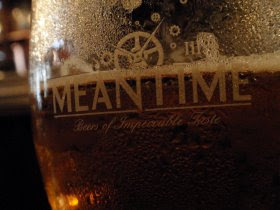 My next choice was even better: a Meantime Helles on draft. Lively, bitter and refreshing. Attention British people: If you must have a lager, consider that one. More on the festival, probably, when I get the chance.